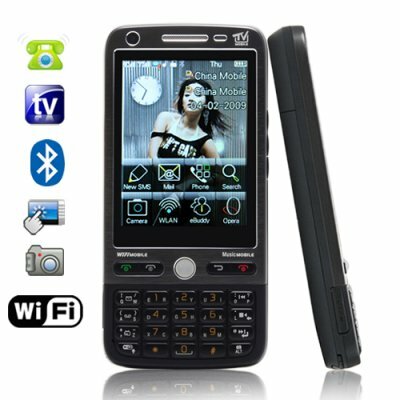 Successfully Added Elevation - Dual SIM Quadband 3 Inch TouchScreen Cellphone to your Shopping Cart. Accelerate your personal communication with The Elevation, the latest bar style cellphone from Chinavasion. This high tech China phone is packed with amazing features like WiFi connectivity, dual SIM standby, an ultra-responsive 3 inch touch screen, a high sensitivity track ball, as well as tons of multimedia and PDA features. The Elevation is a first-class quad-band cell phone that operates seamlessly on the four standard global GSM frequencies (850MHz, 900MHz, 1800MHz, 1900MHz) so you can trust it to work anywhere in the world. Even better, this cell phone was never locked and can be used with any cellular network of your choice - just plug in your SIM card and go. With its WiFi and GPRS capabilities, you can constantly stay online and get updated on what is happening around the globe, chat with your friends using eBuddy, check your Email when you are away from your computer, or even get help from Google Maps if you are in unfamiliar territory. With a 2.0 MP picture/video camera and voice recorder, you can immediately capture those unexpected, important or even embarrassing moments in your life. The Elevation provides a powerful antenna that can pick up your favorite TV or radio station, as well as a media player that plays today's most popular media formats such as MP3, MP4, JPG, 3GP, etc. The Elevation China phone is quick and easy to navigate and the in-hand design makes using this phone both comfortable and convenient. Its ultra-responsive 3 inch touchscreen can be easily accessed by either your finger, or the built-in stylus. The high sensitivity track ball is an alternative way to fully take control of the phone, and the Blackberry style compact keyboard is both innovative in design and accurate for typing and fast TXTing. Designed to be the easiest phone you will ever use, the Elevation Cellphone was made for today's busy lifestyle and will cater to your every need, whether you are a corporate executive or full-time parent. The Elevation is expected to be one of our top sellers and makes for a great resale item due to the combination of high quality and low price, so be sure to get your inventory now! In stock for single piece or large bulk purchases, order it today and we will express ship it out within 24-hours. Where do I find the menu for Java Applications? Java Applications and Java Settings are located inside the Game menu. Does this phone come with an analog TV tuner? No, this is better than all of them. Unlike other Chinese made mobile phones, this phone comes with a full 12-month warranty from Chinavasion along with a professional in-house customer support service. You can also be secure in the knowledge that your phone has gone through rigorous QC testing before it is shipped direct to you. I have had the "Elevation" for a little over a week and I'm still discovering all the things it can do. It takes a while to figure out, because you need bionic eyes to read the manual (the type is near microscopic!) and sometimes the english translation is less than helpful, but it's not too hard and there are so many cool features! The phone also arrived very quickly to the USA via Fed-Ex- 3 days! The battery life could be longer, but it comes with 2 so this shouldn't be a problem. Make sure to charge them both fully (and CORRECTLY- don't turn the phone on while they're charging for the first time, and let 'em charge a good 12 hours) and you should be happy. Very nice phone for the price. Thank you, Chinavasion- I will recommend you to my friends! Телефон супер! У нас такие не продаются, особо нужно отметить качество воспроизводимой музыки!!! В первый услышал реальный 3D эффект, что называется, в домашних условиях. ТВ приемник принимает 16 каналов, все в цвете и отличном качестве. Очень рекомендую! Получил на 10 день после оплаты, доставка была службой EMS (Украина).